Sometimes you just have to get away….sometimes far away. A few weeks back, I did just that and gotta admit— it was hard returning to reality. I am neither a loner or a follower but on this excursion, I was both. 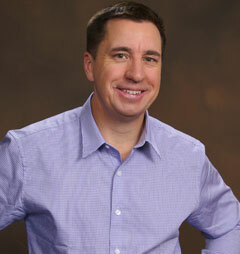 First, I “followed” the leads of many good friends who have recently shared with me, while they love their family, they have had extremely therapeutic vacations by themselves–whether it was climbing a mountain, running a marathon or going camping—getting away–away from everything was good for them. Being a loner for a little while, was good for me too. With my kids scheduled to be out of town for a week and a half, it was the perfect time to make it happen and I knew where I wanted to go for my “Great Escape,”—the only part of the country I really hadn’t spent a lot of time in—the great Northwest. Yes, I’ve been to the great city of Seattle many times but wanted to check out the rest of the region where I had a checklist of stops. I booked a flight arriving in Seattle and then eight days later would fly home from Minneapolis. On a trip like this you have to make progress on the road but I wanted a “loose” schedule so it would be relaxing and provide the flexibility to enjoy every day. 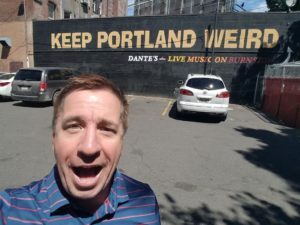 While Seattle is a gorgeous city, I had always wanted to go to Portland, Oregon and the city more than lived up to the hype—fun, free and yes they pride themselves in being weird which you gotta respect..
Portland had a great downtown, I could have spent days there but had to hit the road. Drove through Eugene, Oregon, the home of Nike and where Animal House was shot back in 1977, and then drove across the state on my way to Idaho where the GPS held steady even when the road sometimes didn’t…. Welcome to the middle of nowhere? Perfect….. Even though the road sometimes wasn’t paved, the trip was so fulfilling, a great chance to collect my thoughts on a number of things in my life–something I have needed to do for sometime. While Oregon is beautiful and I loved Portland, I must say Boise, Idaho is one of our country’s most underrated cities. 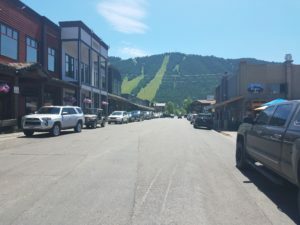 It’s very easy to get around, has a lively downtown area where the city is in such great shape that it seems like everything is new for the most part. 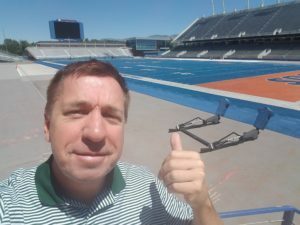 And when in Boise, I had to check out it’s blue football field…. At that point, the plan was hitting up Yellowstone National Park but many locals told me I had to check out what would become the best part of the trip—Jackson Hole Wyoming, This place is seemingly great for all seasons—Whitewater Rafting in the summer and skiing in the winter—I can’t wait to take my girls here, it was the highlight–so much to do and see like buffalos on the side of the road….?! 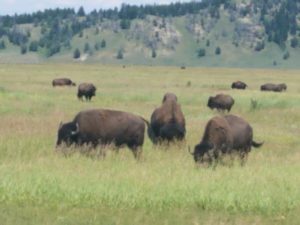 After spending more time in Jackson Hole and Yellowstone than I expected, the rest of the trip was trying to get through the Dakota’s—–where I had to see this…. 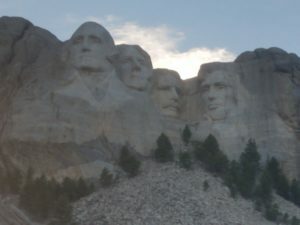 Mt Rushmore was a highlight, smaller than I expected but very impressive—beautiful drive to get there where the trip was almost over. Gotta admit North Dakota was uneventful but checking it off the list only leaves me Alaska and I’ve been to every state. My daughter suggested I should go to Alaska for my upcoming birthday (50 for my 50th) but this trip was the perfect early present. I look forward to many future trips with my girls but this one was a needed solo act—I highly recommend it on so many levels. The Great Escape, the first stop in another drive around the Naborhood, as always, thanks for stopping by. ROAD RULES: Hitting the road is easier than it used to be where if you do it for at least a week you learn to appreciate a few things, here are my lessons…..
(1) GOOGLE MAPS ARE YOUR FRIEND: You want the best brewery in town? the best brunch? the top five restaurants—dial up Google Maps on your phone and I was never let down. Not only does technology take you right there but the internet now gives you instant feedback on the best parts of any location. I have a road rule, I never want to eat at a chain or anyplace I could eat at home—thanks Google Maps for giving me the best of the great Northwest. (2) MOST PEOPLE ARE NICE: Despite what we see on the local and national news, there are a lot of good things and great people out there. I liked being on the road not knowing anyone where I met plenty of great people—from the 60 something men who sat next to me at a baseball game in Seattle who get together once a year and wear their high school baseball hats to the great couple I met at a brewery in Portland to the friendly bartender in Boise who told me how great Jackson Hole is—most people are nice in this world—refreshing to see that again from the road. (3) SINGING IN THE CAR IS …FUN! : When you spend at least four hours a day in a car by yourself you have a lot of time—every so often I would hear a song I hadn’t thought about in years and would sing it with the windows down in the middle of nowhere. Nobody except maybe the Yellowstone Moose or Buffalos heard me—and that’s a good thing. (4) THE ONE CONSTANT: Sorry McDonald’s, at least in the great Northwest–there is one constant—damn those Dairy Queen‘s are everywhere. 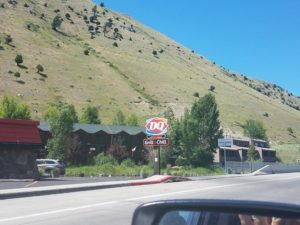 I don’t care if I was in the middle of Oregon, Montana, Idaho, the Dakota’s or even Jackson Hole—you could always count on DQ to the rescue—amazing the staying power of this franchise, I admit to stopping once for ice cream—you can cheat on your vacation right? MR ROGERS’ DOCUMENTARY: I hardly watch any television anymore but when I do it’s likely a documentary. I love the NFL Network’s series “A Football Life,” ESPN’s 30 for 30 series and HBO had a great one recently on the late Robin Williams. 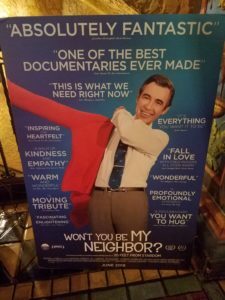 The latest was checking out, “Won’t be my Neighbor?” a documentary commemorating the golden annivesary of Fred Rogers’s PBS show for kids. I’ve had my Naborhood brand for years beginning at the local TV level where we kicked it off on a Sunday night show back in the nineties which was fun—the inspiration was the one and only Fred Rogers who has been with me my whole life. Mr Roger’s Neighborhood started the year I was born and I remember my Mom telling me many years later that Dad would come home from work not sure if his son should be watching this, basically saying “who is this guy?” I probably would have said the same thing at the time. He wasn’t a tough guy, Fred Rogers had a different approach which wasn’t accepted at first but through time he became an innovator and a needed independent thinker. Ironically, I brought my Dad to the showing of the doc where we both really enjoyed it. Fred Rogers originally wanted to be a minister but then was inspired to do television and the rest was history. I thought this production started very slow but then turned into a revealing look at a man whose approach really refined how people related and ultimately taught children about life. His story isn’t playing at all the theatres but remarkably is now the highest grossing biographical documentary of all time, earning that distinction once it passed the $8.4 million mark and is now on pace for an unbelievable 20 million at the box office. It’s also got the biggest documentary box office in five years and is currently placed 14th all-time in this list. Great time to be in the Neighborhood….. THE T.O. DILEMMA: I’m a big fan of Mr Rogers and —those Hall of Fame speeches. I don’t care what sport as it was great hearing the likes of Chipper Jones, Jim Thome and my favorite–Jack Morris‘ heartfelt perspective on the ultimate individual honor in sports. Everybody has a different story to tell and a different reaction to the honor—each one is fascinating to me and a big reason why I decided to cover sports for a living—it’s not the highlights, it’s the great stories along the way. Which leads me to Terrell Davis (T.O.) It’s his decision after being spurned by Hall of Fame Voters for two years, that he will be making the unprecedented move not to attend this year’s Pro Football Ceremony—-it’s his day but I think down the road, he will really regret this. I agree with T.O that he should have been a first ballot Hall of Famer—the man is second in NFL History in receiving yards and third in touchdown—those petty HOF voters should have made him a first ballot guy . T.O. has decided to make his speech at his alma matter in Chattanooga, Tennessee which again is up to him but he’s denying an experience to be not only with is family but with his fellow Hall of Fame Class and all his fellow Hall of Famers already enshrined. None of those people voted against T.O. to be in the Hall–why let those who did ruin his day? 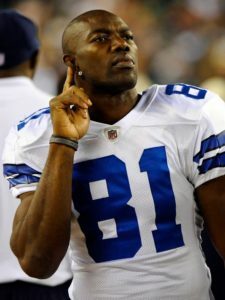 I don’t agree and while T.O may enjoy being different as he did many times as a player, I gotta think down the road maybe five, maybe even 10 years down the road–he may rethink this move and wish he would have rewarded himself for such a great career. Then again, T.O. has always done things differently, he might just take pride in doing this different as well. NOBODY ASKED ME, BUT… You know it’s always good to try new things and for that matter new foods—let me pass on a few great recommendations from the road. First, everyone loves donuts (not a stretch right?) but when in Portland, Oregon check out the institution that is VooDoo Donuts. It’s open 24 hours a day and almost always has at least a 20 minute wait. 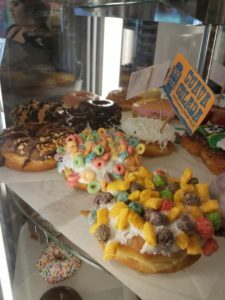 VooDoo Donuts give you a little more—like it’s popular “Captain, My Captain” with Captain Crunch on top of the donuts—you get the idea? 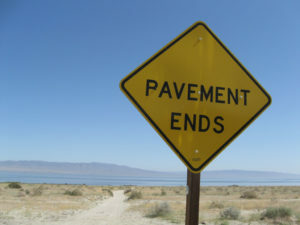 This place is different and fun and afterwards, I needed a long run…. From Donuts…to Grasshoppers? I heard they started serving these last year at Seattle’s Safeco field and had to check them out. They are affordable (only 4 dollars) and while they look repulsive. they actually taste like salted popcorn. 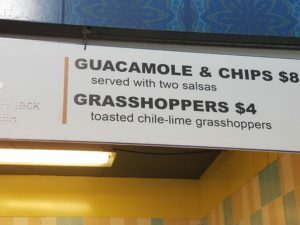 These grasshoppers have become a hit and have actually sold better than expected. The Mariners have always been the leaders of Big League Concessions— they were the one of first teams to offer sushi, thanks in part to their Japanese ownership. Grasshoppers, like many insects, are filled with protein. 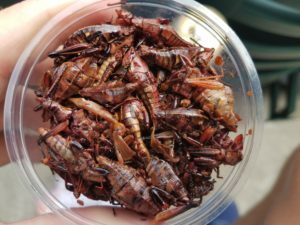 They are advertised on the Poquitos menu as “gluten free.” They are most popular in Mexico, where they are called Chapulines. In case you’re wondering (and I know you are)—the Food and Drug Administration permits the sale of insects as long as those insects were intended to be used for human consumption.